The heart beats and blood flows. There is sound, faint or strong. There is movement, slow or fast. Hearing the heart’s work is one of the oldest ways for discerning health. One of my earliest memories of trips to the doctor involved a lab-coated person uncurling the stethoscope from around his (when young, it was always a man in a white coat) neck and listening to my heart. Some doctors warmed the drum before touching my skin. Some—brrrr!—did not. Whether thoughtful or thoughtless about cold metal on sensitive skin, the doctor then listened to me, to my heart, to the flow of my life. Our hospice patient had a dangerously fast apical pulse rate. It was one of the most obvious symptoms that her/his body had become vulnerable. The chart chronicled numerous other health issues, but the pulse was—quite literally—the loudest. Ah, the chest . . . the home of the heart, the spot where the apical pulse rate is loudest. I’m not a medical person. By background I’m an ordained minister and amateur writer. I don’t experience and evaluate the world through stethoscopes or by analyzing white blood cell levels. I wear my heart on my sleeve. I know the value of heart-to-heart talks. I believe that where your heart is, there your treasure will also be. I trust good-hearted friends and wonder why some people are so hard-hearted. My heart breaks if someone is hurting. I’ll cry at a heartfelt speech. Yup, I’m a metaphor man. Figurative speech is my gig. Sure, if I wielded a stethoscope, with its (warm, please) drum correctly positioned over a patient’s heart, I could declare, “Your heartbeat is loud.” Or fast. Or slow. Or faint. But I wouldn’t know what my observations meant for the now and future health of a person. But I’d want to ask any hospice patient, or family caring for someone with a life-threatening illness, how is your heart? Who do you need to have a heart-to-heart chat with? Where is your heart broken? What or who lifts up your heart and helps you make it through the day? 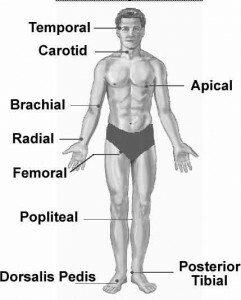 The radial, carotid and apical pulse give clues to a patient’s situation. Now, after the chaplain’s question and a nurse’s answer, I understand them a tad more. With a stethoscope or a compassionate question, the heart reveals our true health. In other words, you can fake with every part of your body except . . . the heart. Images: pulse locations drawing from here; basketball picture from here.